The first person is asked to bundle up and deliver quantities of unfolded boxes in three colors to the two pre-assembly stations. The quantities are in response to a customer order. One pre-assembly station folds the large boxes while the other pre-assembly station folds the small boxes and both stations secure their boxes with a rubber band. The boxes are then passed ahead to the assembly station where the fourth player opens the large box and places the small box inside. The player writes out a ticket, folds it, places it on topof the small box, and then closes the large box and secures it with a rubber band. The box is then passed to quality control/dispatch where the fifth player opens the large box and checks to see that the ticket is present and properly written. This player signs and stamps the ticket before placing it back on top of the small box. The large box is then closed, secured with a rubber band, and delivered to the customer. The players are told to work at their own pace to produce the three colors of box in response to the customer order. Soon every player is trying furiously to complete his tasks, first for one color of box, then for the next. However, a huge mountain of boxes quickly builds up in front of the fourth player, who has a bigger job than the others. In addition, the customer announces that he wants to change his order, to receive first whichever color of box the team has left till last. This quickly produces even more of a pile-up as the wrong color boxes are pushed to the side so the right color can get through. The team of five is then asked what’s wrong and what could be done about it. 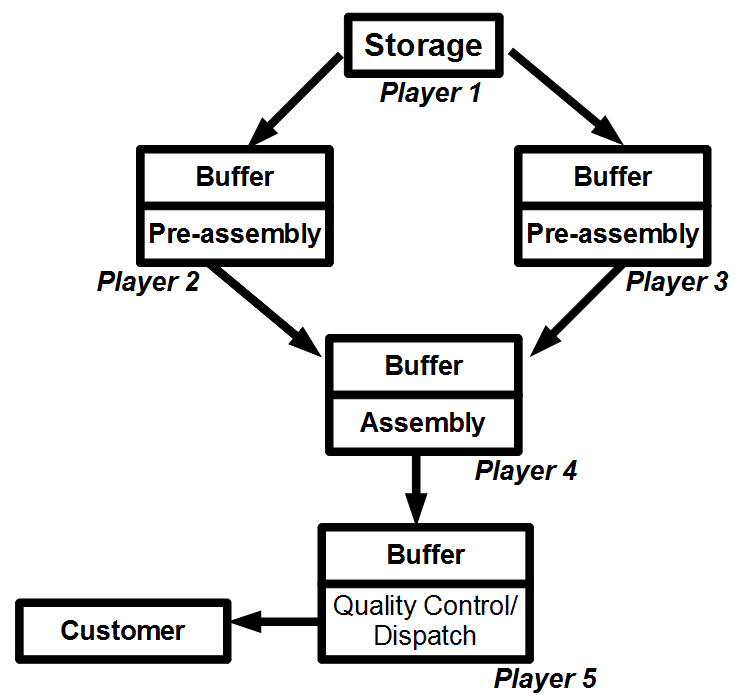 The answer is always the same: “The fourth player is the bottleneck so we need to add another worker to the assembly step and build a storage area between steps two and three”. The game coordinator then suggests that instead the five players should try a pull system by making only five boxes at a time and only when asked (pulled) by the next player downstream. To the player’s amazement, the whole activity proceeds smoothly, with oly a tiny buildup of boxes between steps two and three. They then play two more rounds, reducing the lot size to three and then to one, eventually achieving perfectly smooth flow and no buildup of boxes at all. Next the game coordinator says the customer is going to vary his orders at random between the three colors of boxes and asks what will happen. The supplier executives recognize this situation as the key headache in their lives and predict chaos. But, of course, with no boxes piled up in inventory, it’s a simple matter to switch from one color to the next. Womack, James P. and Jones, Daniel T. Lean Thinking. Banish waste and create wealth in your corporation. Pp 208-209. Ed Simon & Schuster UK, Ltd. 2003. London, UK.